Becca is the stepsister to Alex. They never truly knew each other growing up because Alex left when his father remarried Becca's mom. When his father dies and leaves half of his ranch to Becca and half to Alex, that is when they both reconnect. I found this story somewhat confusing. I liked the premise of the SEALS coming home and wanting to put a ranch together to help other veterans reintegrate back in to society, however, I felt cheated because you never got to see the end result. Throughout the story they are all working their butts off for this end result, but I felt that despite the premise, the romance overtook the rest of the story. Also, the idea that the SEALS were the only characters needing therapy was not quite true. Becca was so sheltered that she didn't really know how to function outside of her ranch. I do want to see what happens with Alex's friends; however, I also hope that their stories have more than just romance. The overall romance was just semi-successful for me. Becca was too sheltered, and Alex was too timid too. It was just hard to believe. 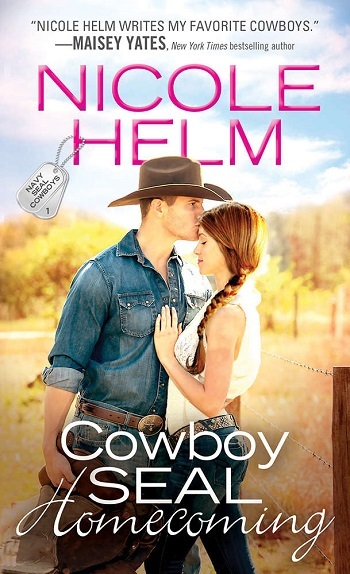 Reviewers on the Wicked Reads Review Team were provided a free copy of Cowboy SEAL Homecoming (Navy SEAL Cowboys #1) by Nicole Helm to read and review.